A public commitment was made to hold elections to the “Stakeholder” Steering Group on climate change, all the way back in March 2012. Details were going to be released in November 2012, so elections could be held at the March 2013 conference. MCFly reported it at the time. Its report was not, for over a year, challenged. 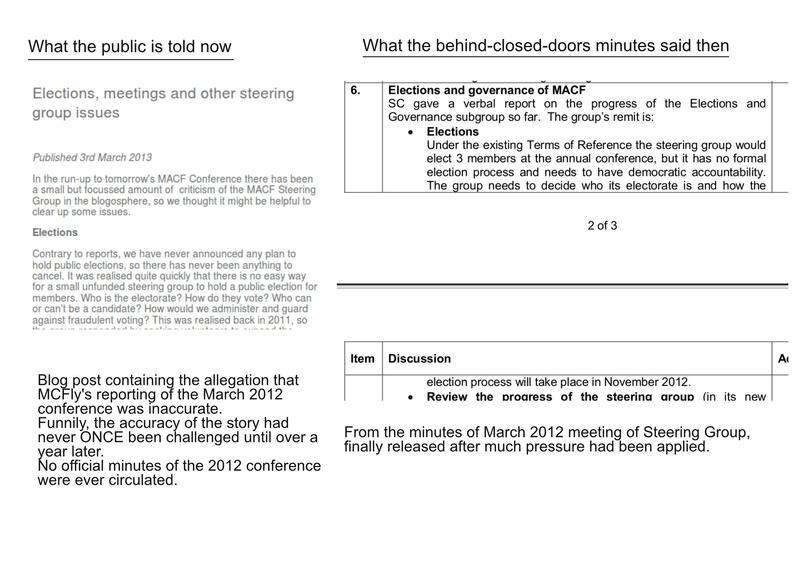 The day before the 2013 conference, at which no elections were held, a statement (see below, left) was released. On the right you will see the official minutes of the group for March 2012. For the benefit of anyone with too little time (or perhaps lacking other resources) to actually check the March 2012 minutes, here’s the rest of what was agreed. election process will take place in November 2012. There will be a review of the steering group in 6 months’ time, in order to give the new model a chance to establish. What is the reach of the steering group and as part of this process, do members want to go down the route of establishing it as a legal entity? The conclusions of these discussions will then be set out in the updated terms of reference. The subgroup will present a substantial report into this at the August steering group meeting. Curiously, the August minutes – and subsequent meetings – have no such document or discussion. No updated Terms of Reference have appeared (or, if they have, they are very well hidden. They are not, for instance, where you’d expect them to be on the official website. ) They were never blogged, that’s for sure. Simple question really – if a group can’t (won’t) even organise elections, why should anyone expect that it will ever do anything useful? This entry was posted in Democratic deficit and tagged Steering Group. Bookmark the permalink.